OCP is excited to announce the release of a brand new Liturgy.com! 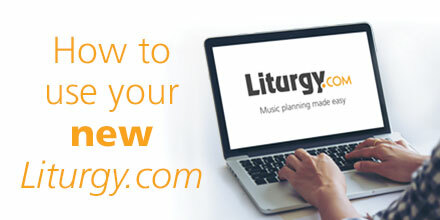 Initially launched in February 2002, Liturgy.com was designed as a tool for liturgists and music directors to prepare liturgies for their parishes. Sixteen years later, we're excited to introduce to you the new and improved Liturgy.com. Try it out! Comprehensive and affordable, the new Liturgy.com boasts a simplified music planner, with the ability to explore new songs and more content to enrich your music ministry. If you're a music director who plans music for liturgies, you're in the right place! Discover - Get more song suggestions from liturgical experts, and customize options to suit your parish. Access excerpts from Today’s Liturgy and Liturgia y Cancíon, past and present. Plan - With a simplified music planner, you can create outlines for Sundays, holy days and special celebrations in an easy-to-use customizable template. Organize - Use the new Scratch Pad to save songs for special liturgical seasons and browse previously used songs from a previous outline. Plus, music is synced with your Breaking Bread and Spirit & Song Digital Music Libraries. Share - Easily print and share outlines with your instrumentalists, choir members and cantors. It’s liturgy preparation that will revitalize your music ministry. Start your free 30 trial today!